Formulated from plant extracts (Phellodendron and Magnolia). Relora weight loss supplement for reducing calorie intake. Relora benefits include reducing stress and its associated bad dietary habits. Relora, a weight loss supplement for curbing the appetite. Relora® is a patented complex of specific extracts of Phellodendron amurense and Magnolia officinalis (the latter is used in Chinese herbal medicine to relieve stress and reduce muscular tension) that helps regulate cortisol levels (“cortisone”). Cortisol is a hormone produced by the adrenal cortex glands in response to stress. Excess cortisol is associated with a number of diseases and health problems (obesity, diabetes, hypertension, depression, osteoporosis, immunodepression) - it has even been called the “death hormone”. In particular, excess cortisol accelerates loss of muscle mass, increases blood sugar levels and stimulates lipogenesis (Shawn Talbott, The Cortisol Connection). Relora® has been developed to control symptoms of anxiety, such as worry, irritability, agitation, fear, anger, muscular tension and cravings, without causing the usual side effects associated with anxiolytic drugs, such as sedation. ¤ Relora® prevented weight gain in 70% of obese, stressed women who were comfort eating' junk food in response to stressful situations. Unlike anxiolytic drugs, Relora® does not lead to dependency, can be given for long periods and is free from side effects. However, as no studies have yet been conducted on pregnant or breast-feeding women, it should be avoided by such individuals. Other ingredients: magnesium stearate, microcrystalline cellulose, silicon dioxide. 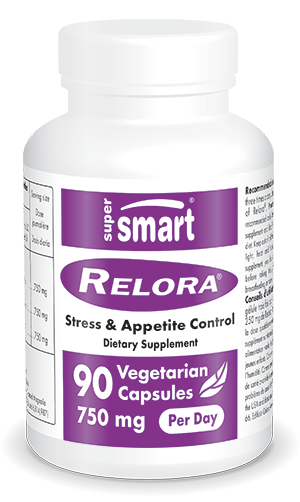 Relora® is a registered trademark of Next Pharmaceuticals Inc.
Each vegetarian capsule contains 250 mg Relora®.